Scrangie: Zoya Holiday sneak preview! More MatteVelvet! Zoya Holiday sneak preview! More MatteVelvet! The ZOYA color experts have done it again! 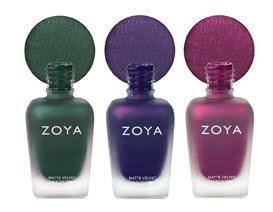 The incredible Zoya MATTEVELVET* shade collection has been expanded with three new LIMITED EDITION beauties. Get all of the color, none of shine with MATTEVELVET*, Zoya’s exclusive blend of matte base and subtle shimmer resulting in utterly wearable and truly stylish nail polish. Zoya nail lacquers are free of harmful industrial chemicals like toluene, camphor, formaldehyde, dibutyl phthalate (DBP) that are known to cause cancer and birth defects. Find Zoya MATTEVELVET* as well as over 300 other ultra high-fashion Zoya shades at www.zoya.com. As always, each and every Zoya color is made for women so we name them after women. MATTEVELVET by Zoya available September 15, 2009. Sug. Retail $6.00 per 0.5 oz bottle. U.S.
Oh my god, the green is one of the most gorgeous shades ever! Each and every shade is made for a woman so we named it after women? that's retarded, men well the cool ones usually wear nail polish too. Wow. I love them all. Fantastic colours. Can't wait to see them properly. They're gorgeoous, but I'm appalled at how poorly the existing Zoya mattes wear. A manicure shouldn't be chipped in 2 hours when all I've been doing is reading. Lovely colors, but completely, totally, no way around it impractical if I can't get from breakfast to lunch without touchups. Savita must be mine, even if I'm not a huge matte fan. These look MUCH prettier than their last three mattes. Can't wait for swatches! If these swatch as pretty as they look in the promo ad, I think these 3 will be my favorite matte shades by far. I want all three for sure! I don't like Matte, but I might buy one of those just because they are such a unique colors. So beatiful. If only they would last longer. Matte Top Coat is a better choice. Just need to find a shade that will look good using mattifying top coats. I have seen photos of China Glaze OMG and Kaleidoscope with matte topcoat and they look really good. First, let me say intensely dislike limited edition polishes, I'm on a limited budget for nail polishes, and every time I try to save up for a big purchase at an e-tailer, some company comes out with a limited edition collection! The only reason I could afford the last MatteVelvets was because of the promo code. That being said, those colors look gorgeous. Maybe I'll be able to get them in September. I have Loredana, and I love it. I can't wait for these! Plum and evergreen...ah! It's times like these when I look at statues of many armed Indian Goddesses and understand why that's a divine quality. I have never had so much fun with topcoats as in the middle of this matte frenzy. !!! I knew I read something about a blackberry matte, I'm super psyched now! Too bad I'm on a no buy. Zoya Guest Post by the amazing KarlaSugar! New Shades from Obsessive Compulsive Cosmetics! Essie Survey with free gift for participating! Barielle Fall Collection is up! Since Twitter doesn't work... OPI Holiday!